The 1960s and 1970s were an exciting time for science and SF. Robotic probes had given humanity its first close up look at the worlds of our solar system: Lunar farside in 1959, Venus in 1962, Mars in 1965, Jupiter in 1973, Mercury in 1974 and Saturn in 1979 (the other worlds would have to wait until the 1980s). The flood of increasingly detailed information about the worlds of our solar system gave rise to a short-lived genre, one that it existed in the tension between how SF had imagined the neighbour worlds to be and what our space probes were revealing. Carol and Frederik Pohl’s 1973 anthology, Jupiter, is perhaps my favourite exemplar of that mayfly genre. It is filled with classic SF stories, most of which had been published between the 1930s and the 1950s (1971’s “A Meeting with Medusa” is the outlier). All these stories doomed to obsolescence thanks to human ingenuity . However, they still make good reading, for the most part. Asimov provides a brief account of the various Jupiters of science fiction before discussing what was known about Jupiter in 1973, what could reliably be deduced about Jupiter, and the long list of questions humans hoped Pioneer 10 and 11 would be able to answer. And of course, some answers only led to more questions. Pohl outlines the purpose of this anthology, which is to celebrate Pioneer 10 and 11, with an assortment of the better classic stories about Jupiter. What caught my eye with this preface and the Asimov intro is that both Pohl and Asimov took the time to assess the appearance of someone else’s wife (golf clap). The great bridge being constructed on Jupiter is vast, impressive and utterly pointless. Or so it seems. In fact, it may deliver to humanity the stars themselves. I never cared for this story or the novel that later incorporated it, They Shall Have Stars. I do have fond memories of the series of which these texts form a small part: Cities in Flight. I admit I hesitate to revisit the series. The Bird is cruel! The inhabitants of Jupiter are hostile, powerful, and aggressive. Nothing humanity can bring to bear can possibly defeat them. Nothing, that is, except miscommunication and ignorance! As someone who continually stumbles over information apparently disseminated in briefing sessions to which I was not invited, I don’t find this funny at all. To judge by the popularity of this story, I am probably in the minority here. This is an early Asimov, so don’t expect scintillating prose. In general, if you want a polished sentence, pulp-era science fiction is not a high grade ore.
Jupiter offers an unparalleled frontier. The converter, able to change a human into a native Loper, seems to offer the means to exploit that frontier. Yet, two by two, converted explorers head out into Jupiter’s howling wilderness and none return. A desperate project manager offers himself and his dog to conversion to unravel the mystery of Jupiter. This has, I think, one of the more memorable final lines in pulp SF. On its own, this story is a bit of a downer but in the context of the entire City series of which it is a part, it is even more depressing. A trader eking out a desperate living on Io faces unreliable natives, plague, and madness. He also discovers the key to a secret none had suspected even existed. This is part of Weinbaum’s future history and the antagonists, the ratlike slinkers, turn up in a number of places, generally in the context of an alien civilization that has for some reason declined. I think the slinkers, somehow, cause the fall of civilizations. But not on Earth. We know from another story that while Earth was visited millennia ago by the Martians, the Martians touched down in Egypt and Egypt, as you know, has cats. I had never noticed how … badly the treatment of the Ionian natives, loonies as humans call them, has aged. Or how off offhandedly the explorer assumes that of course the loonies cannot understand the significance of the ruins they guard. Normal, everyday conditions routinely faced by a patrolman at sea are instantly lethal to the unfortunate off-worlders whose ship touches down nearby. The occupants have been transmogrified into a thin, sticky film on the ship’s deck, but the damaged ship remains a treasure worth fighting for. Recall my comments about pulp prose. Still, Rothman uses the word “actinic.” which is a fine word. Not 100% sure that this story is actually set on Jupiter; the gravity seems much higher than a mere 25 m/S^2. The Ionian sun-engine, relic of a long dead race, promises wealth incalculable… if the explorers can survive what the sun-engine is powering. An unremarkable story, to my mind. Not bad, not all that good. This is one of the stories I did not immediately remember on seeing the title. I think I may not have Gallun receptors in my brain. A crippled man finds new life, telepathically controlling an artificial life form down on the surface of Jupiter. If you’ve seen the movie Avatar, this will seem very familiar. Note the publication date. I would really like a look at James Cameron’s book shelves…. Jupiter’s vast gravity well may prove the key to an interplanetary rally! On the one hand, yay for recognizing that Jupiter’s mass is a handy resource (don’t ask unless you want a long hand wavey discourse). On the other hand, someone had to write the worst clunker in this collection and that dubious honor fell to Del Rey. A near-fatal airship accident leaves Howard Falcon a different man, the ideal candidate for the first crewed exploration of Jupiter. It is good the Kon-Tiki will have a thinking mind on it, for Jupiter is an inhabited world…. This may or may not be in the same world as Rendezvous with Rama. It definitely shares a detail with it, genetically engineered primates called simps. In Rama, the purpose might have been to drawn a parallel between the Ramans and the humans. I have no idea what was going through Clarke’s head, except to hope the buttons he seems to be pushing with his obsequious, dim serviles are not the ones he intended to push. The simps are a minor part of the story (far more space is spent exploring Clarke’s vision of Jupiter) but they are an uncomfortable one. The cover is by John Berkey. 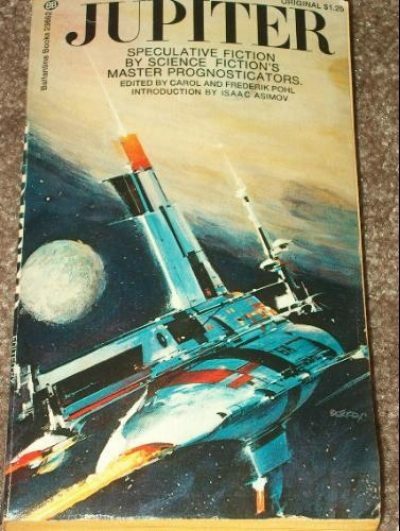 Berkey provided the cover art for a lot of the books I enjoyed as a teen. I have a conditioned reflex to look on any book with one of his covers with anticipation and hope. This book is one of the reasons I have that reflex. If I had to make a list of notable pulp stories about Jupiter, the list I would come up with would be that table of contents. Well, minus the Gallun and the Del Rey. The prose in these stories is often clunky, and time has not been kind to some cultural assumptions. Fred Pohl had extensive experience editing anthologies . Carol Pohl’s CV is much shorter, but even if this had been her only anthology, that would be sufficient to earn my warm regard. Jupiter seems to have had one printing a half century ago. I don’t offer much hope of finding it. 1: George R. R. Martin would be nominated for a Hugo for his examination of the tension between science and myth in 1973’s “With Morning Comes Mistfall.” But that is a tale for another review. 2: Also magazines, and books. If there existed a job classification in SF publishing, Fred Pohl filled it at some point in his career.